I happen to love latin-inspired foods, and we eat a lot of cilantro-laden and often spicy foods around here. Fortunately our son enjoys the heat too, so we can prepare foods to suit our tastes, but occasionally we have to modify the heat a bit to his liking. So when I ran across this recipe in Whole Foods recently, we tested it out and agreed it was suitable for all of us. Courtesy of Whole Foods, this is a slightly spicy, light and fresh salsa that makes a great dip for chips or addition to fajitas hot off the grill and breakfast tacos. So depending on your family’s preference, add chiles to suit your tolerance for fire, and enjoy a delish, gluten free, paleo friendly salsa to complement pork, chicken, beef or simply as a stand alone for your preferred dipping choices (we recommend celery or fresh, home-made zucchini or kale chips). 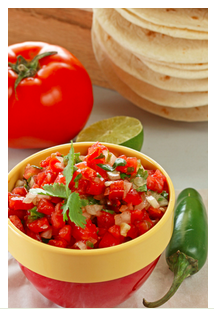 Place diced tomatoes in medium-size bowl, add cilantro, garlic, onion, lime juice and salt. Taste a tiny bit of both serrano and jalapeno chiles to gauge degree of heat and add according to preference. 1 Pings/Trackbacks for "SPICY TOMATO SALSA WITH CILANTRO AND CHILES"